It seems like we’re in the middle of a renaissance for downtown lunch options. On A Roll continues to kill it Tues-Fri with fresh, delicious meals and a rotating menu in their silver trailer; NYC Gyro has substantially stepped up their falafel game (try the baba ghanoush); and SaZa will serve you a great slice of pizza with toppings of your choice at a reasonable price. We’ve been meaning to make it to the new downtown D’Road location, but by all accounts it continues the amazing quality of the original site. 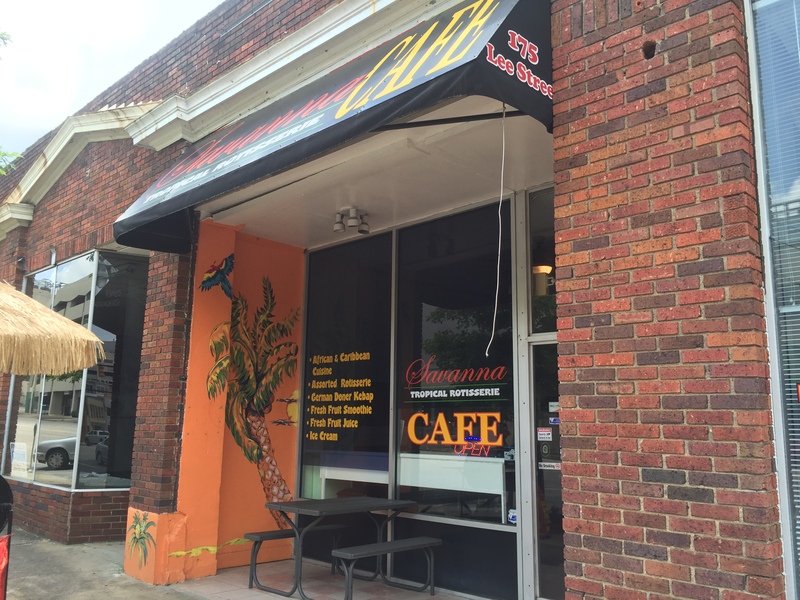 And we’ll certainly try it, but our new main lunch crush is Savanna Tropical Cafe. They describe the food as Jamaican and African. We’d describe it as delicious. I first heard about the place from some colleagues bragging on the plantains. My ears perked up. Plantains! You can buy them at the Capitol Market on the Boulevard and cook them yourself, or you can just go to Savanna and get them fried or steamed. And they’re ridiculously good – some of the best we’ve ever had. They’re golden, sweet, and soft without being oily. The restaurant itself, tucked into the Lee Street side of the old Bell Building, is small and intimate, with good music playing and a nice selection of tropical drinks and juices on offer. The menu is pretty big for such a tiny place – the day we were there, the proprietor was careful to tell us what was available that day and what wasn’t. We wanted to try the veggie patties, but they were sold out and we’ll come back another day to see about them. 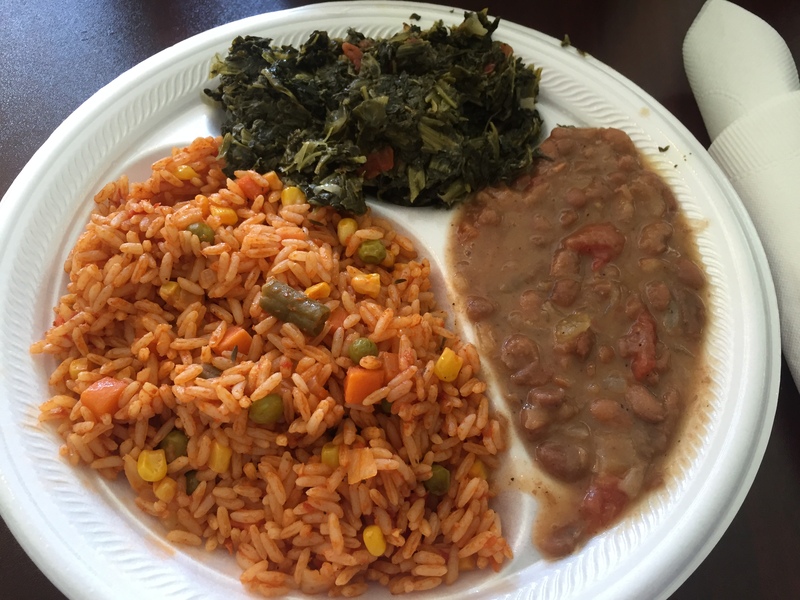 On this visit, we each tried a veggie plate – one with dirty rice, a spinach and turnip mixture, and beans. The beans were simply transcendent, especially mixed with some rice. 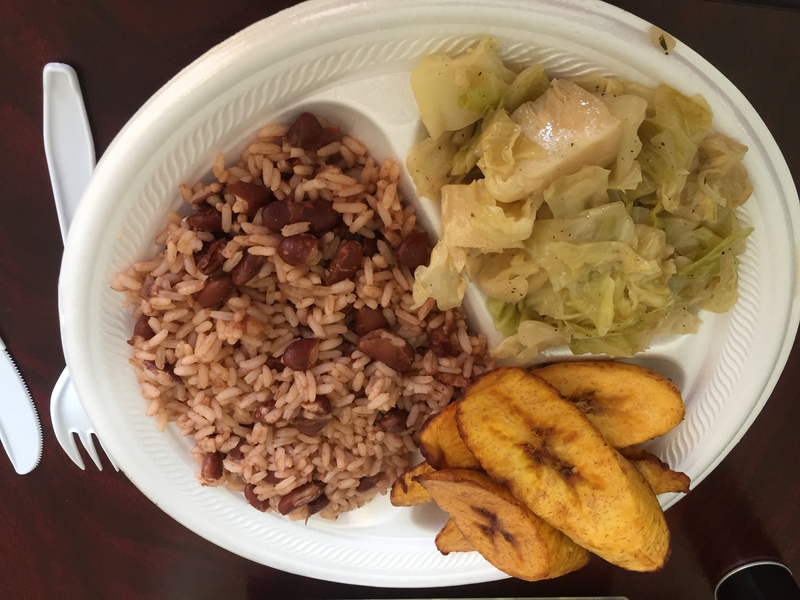 The other plate featured rice and peas, cabbage, and plantains. The cabbage was silky smooth, with none of the limpness that often comes from stewing in a pot all day. When we sat down, we noticed what looked like homemade Jamaican jerk sauce on the table. It was labeled “mild.” This made us hope for its hotter cousin. And sure enough, the server brought us a container of the spicier stuff on request. The absolute perfect complement to our meal, it brought the sweet plantains and the mild rice into high resolution. We agreed that we would purchase this sauce in a retail setting, and would love to take some home with us. All in all, this is the kind of simple and affordable lunch that we’ve been looking for. It’s hearty without being salty and greasy. It’s filling and affordable. And the overall vibe in the restaurant is perfect for a relaxed, quick lunch. What a find! It’s hard to imagine that we’d want to go just about anywhere else downtown for lunch having eaten at Savanna. We’re curious to know what our carnivorous friends think of the other menu options, but we’re going to be loyal customers based purely on the vegetarian options. Check it out. We’ll be back again and again.